The Missa Brevis No. 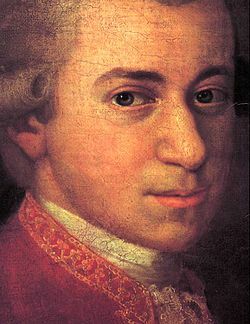 9 in B-flat major by Wolfgang Amadeus Mozart, K. 275/272b, was probably written before September 1777 for Salzburg. The mass is scored for soloists, choir, strings and organ, the latter supplying figured bass for most of the duration. 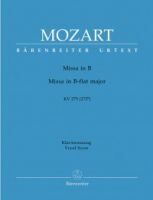 The most popular vocal scores for Mozart's Missa Brevis are shown below. In the Gloria and the Credo, Mozart eschews the traditional concluding fugues. Despite being a missa brevis, the Agnus Dei is very long and there is "a prolonged setting for soloists and choir of 'Dona nobis pacem', ending piano." The Dona nobis is set as a gavotte, "like a vaudeville, and has been compared with the specimen of this genre at the end of Die Entführung." The premiere probably took place on December 21, 1777, with castrato Francesco Ceccarelli among the soloists singled out for praise for his performance. Elsewhere church musicians were offended, such as those at Wasserburg am Inn, who found Mozart's setting "an open mockery of the holy text."